Live like a king or a queen in this return to the medieval times. Click here to play! You'll have to battle brave knights to win your queen's heart and if you're successful you'll be sitting on a princely fortune! As this is a quest for the crown, it's imperative to spin the crowns. Two to five of these on a pay line will get up to 10000 times your line bet. It will also substitute for all other symbols, excluding scatters, to help you create more winning combinations. Princesses and knights will also contribute to your fortune. Two to five princesses on a line will get you up to 2500 times your line bet. 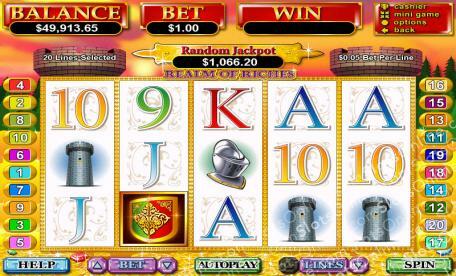 Two or more knights will get you up to 1000 times your bet. Shiny armor and castle keeps will also pay out, each getting you up to 500 times your bet. If you're going to battle knights, you'll need a shield. Two to five of this symbol will multiply your total bet up to 50 times. It will also trigger a re-spin feature, and three or more anywhere on the board will get you 25 free games. So, join in on this adventure to put in your stake in on a fortune worthy of a king! The sheild acts as a scatter symbol. Two to five of these anywhere on the board and you'll get up to 50 times your total bet. It will also trigger a re-spin feature. Three or more anywhere on the board will award you with 25 free games. During these free games the crown will expand to cover the entire reel before prizes are awarded. The jeweled crown is a substitute in this game. Two to five of these will payout up to 10000 times your line bet. It will also replace all other symbols, excluding scatters, to create more winning combinations.